There were a couple hints early on for Drew Gagnon that his night might go pretty well. The starter felt pretty good warming up in the bullpen. And once he got on the mound for the game, he felt like his catcher, Colton Plaia, was just 40 feet away, rather than 60 feet, six inches. “When he feels that close, that’s an amazing feeling,” Gagnon said. Only good things followed for Gagnon, who threw a complete game shutout in a 6-0 victory over Tacoma in the series opener at Cashman Field. Gagnon essentially stayed out of trouble all night, allowing just two hits while striking out eight. He didn’t allow a runner past second base, aided by a pair of double plays. He faced just one batter over the minimum and retired the last 14 Rainiers (64-69) he faced. 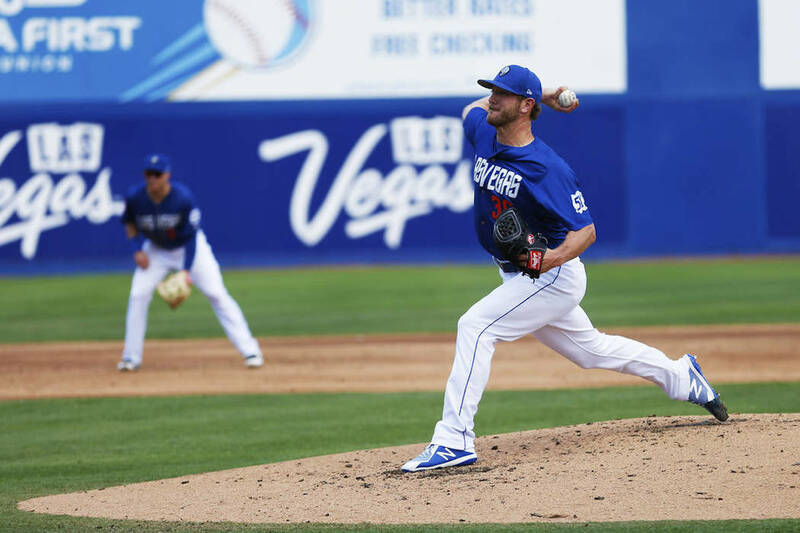 It was the first time a 51s (66-68) starter threw a nine-inning complete game all season and it was a bounce back performance for Gagnon after he had given up nine runs in his past two starts — which spanned 10 innings — combined. Gagnon said being on control of himself was the biggest difference for him on Tuesday. His slider, in particular, was his go-to on Tuesday, he said. He got all the run support he needed in the first inning when the 51s scored four runs on RBI doubles from Patrick Kivlehan, Bryce Brentz and Zach Borenstein. Kivlehan added a two-run home run in the sixth inning, his 17th of the season. Third baseman David Wright, with the 51s on rehab, went 1-for-4 for with a run scored in the first inning and made a couple of nice plays at third base. Brentz made his first start since tweaking his ankle over the weekend. DeFrancesco said he reaggrevated his ankle on his RBI double. He was taken out of the game Tuesday and is day-to-day.